Welding equipment is an investment in your career and your livelihood, not to mention, some of it is pretty costly! The last thing you want is to have to replace your equipment prematurely. Proper use and regular maintenance can prevent problems like uneven wire feeds, erratic arcs, and machines that run too hot. Help your equipment last longer with these 5 tips. Stay within the usage specs. This is the most basic, commonsense way to take care of your welding equipment. Toronto welders should use welding machines appropriate to the project and implement a duty cycle to prevent pushing the machine beyond its limits. Keep it clean and protected. You can extend the life of equipment and prevent damage by keeping machines and components covered when not in use and blowing them out after use to remove debris and accumulated dust. Do your grinding far away from the machine as well as any woodworking to minimize fire risk and mechanical hazards. Inspect before each use. You know you should be inspecting your equipment before every use, but do you also inspect all of the electrical connections and components, if not every time, at least routinely? Check and clean the wire feeder and drive rolls, inspect all cords and connectors for wear, and ensure circuit breakers and interlocks are working properly. Do routine maintenance. Regular inspections, cleaning, and greasing will help keep equipment in good operating condition and alert you to any minor problems before they become too big or cause an unexpected problem. Replace parts when necessary. Of course, if you ever have broken, missing, or worn welding equipment in Toronto you should replace it right away. We hope you’ll remember Josef Gas when this time comes! Here you will find everything you need to keep equipment in top operating condition and if we don’t have it in stock, chances are we can order it for you! Just ask! If you need welding gear, gases, or welding equipment in Toronto, visit Josef Gas. We carry equipment, electrodes, wire and more from all the big brands and even the small ones! 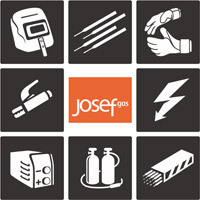 Visit our website at www.josefgases.com, call us at 416.658.1212, or contact us online to discuss your specific needs or visit us in person at 201 Basaltic Road, Concord, ON L4K 1G4.